Before a winner is chosen, the person's entries will be verified. For example, obtained points for commenting on a blog, or following on Twitter. Some people are clicking that they done all the entries when in fact they haven't. You're only wasting your time as the winner will be the person with the most verified points. 2. We will notify the winner via email within 48 hours after the contest's end (11:59 pm on Aug 30). 3. This is a worldwide raffle. All are welcome. I have read books by both RJ Parker and Bernard DeLeo and they never disappoint! 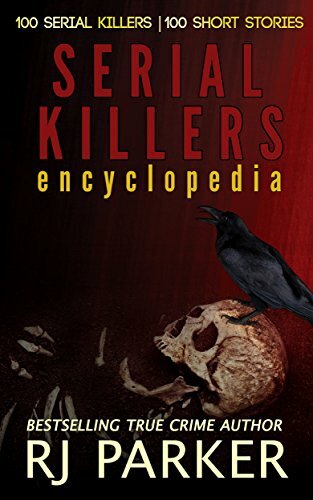 Their books are filled with facts and research about some chilling serial killers. I especially like Mr. Parker's Women Who Kill and Mr. DeLeo's Demon books. These author's are fantastic and I know you will love their work! I loved this giveaway! Tks! Great giveaway. Thanks for sharing.. I watched the "Jack The Ripper Indentified" on YouTube. I watched the "Dr H H Holmes and the Whitechapel Ripper" video on YouTube. I watched the "Dr H H Holmes and the Whitechapel Ripper" video on YouTube --- very well done! I watched the "Dr H H Holmes and the Whitechapel Ripper" video on YouTube -- my YouTube name is: Sam Smith. I watched the "Dr H H Holmes and the Whitechapel Ripper" video on YouTube -- great video! I watched the "Dr H H Holmes and the Whitechapel Ripper" video on YouTube -- wow, you're up to 271,636 views -- congrats! I watched the "Dr H H Holmes and the Whitechapel Ripper" video. I watched the "Dr H H Holmes and the Whitechapel Ripper" --- impressive 272,751 hits so far on YouTube. Already posted for the Kindle now I'm posting for the 100.00 Thanks for sharing and having all these contest. I viewed the "Dr H H Holmes and the Whitechapel Ripper" YouTube -- very kool video! I watched the "Dr H H Holmes and the Whitechapel Ripper" video on YouTube -- it now has an impressive 273,534 views! I watched the video "Dr H H Holmes and the Whitechapel Ripper" -- great video, by the way. I watched the "Dr H H Holmes and the Whitechapel Ripper" video on YouTube -- up to 279,372 views! It's my first time seeing a author giving books and stuff to people. Hi, thanks for all this, but just tto let you know that I can't open the link for "Follow RJ Parker's website". Would love that fire. On another note, love RJ's books, very informative. And cannot wait to read the new Holmes/Ripper book. I think I commented, well I know I typed one up, but will repeat that RJ's books are very informative and I love reading them. Cannot wait until the new Holmes/Ripper book is released and will probably be the first in line to buy it. I viewed the Dr H H Holmes and the Whitechapel Ripper" video on YouTube. I watched the Dr H H Holmes and the Whitechapel Ripper video -- wow, 285,080 hits!